The Marshall and Rose Ampico Grand Piano, London, c. 1927. The phenomenal commercial success and sheer size of the Aeolian, Weber Piano and Pianola Company, founded in the summer of 1903 by H.B. Tremaine and his colleagues, gave many of the other American piano manufacturers pause for thought. Much of the piano industry consisted of family businesses, formed in many cases in the aftermath of the Civil War, which had flourished in the late nineteenth century, but which increasingly needed to amalgamate in order to survive in the world of mass production and the consumer economy. Aeolian's main competitor came to be the American Piano Company, established in 1908 as a merger between Chickering & Sons of Boston, William Knabe of Baltimore, and Haines Brothers, Marshall & Wendell, and Foster, Armstrong & Company, all of Rochester, New York. At a very early stage in its development, the new business recognised the commercial advantage of the reproducing piano, and it purchased the invention and expertise of Charles Fuller Stoddard, a young firebrand of an engineer who had begun work on patenting a practicable piano recording and playback system by 1908 at the very latest. Welte-Mignon and the Hupfeld Dea, and it was the latter from which Stoddard seems to have drawn his inspiration, revealingly hinted at by the small but significant number of Hupfeld recordings which were converted under licence to the Ampico system. 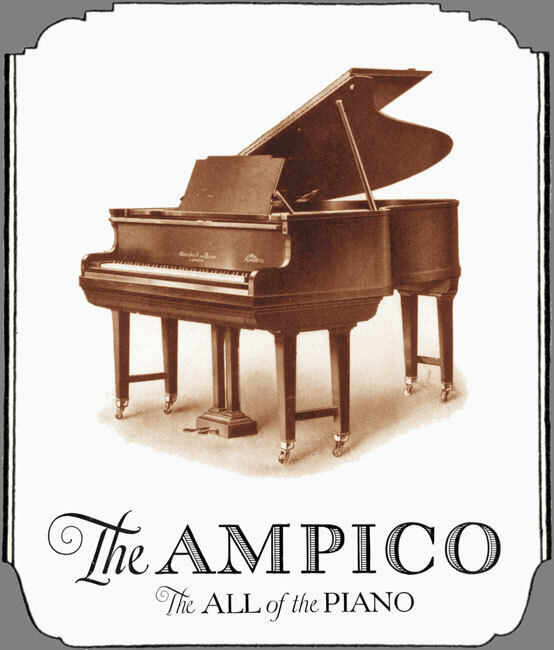 The Artigraphic was first launched around September 1911, and after about a year the name was changed to the Stoddard-Ampico, though it took a while for the change to work its way through the American piano industry. These earlier systems were simpler than the later Ampico reproducing pianos, and indeed the Ampico was refined and modified more extensively than any of its main competitors. 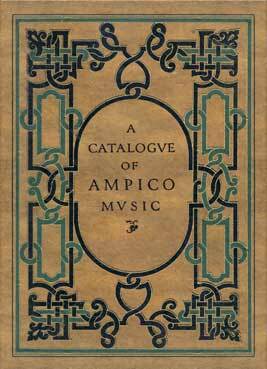 An early Ampico catalogue - New York, July 1916. 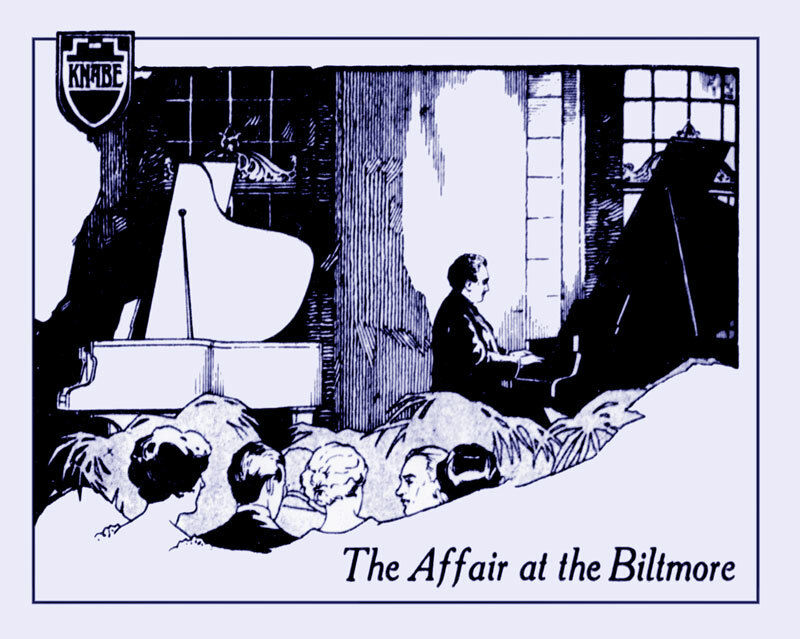 Godowsky Plays alongside the Ampico - New York, Biltmore Hotel, 8 October 1916. "The affair at the Biltmore held last Sunday would have been a scandal five years ago. For fancy, that great pianist Leopold Godowsky actually permitted a music roll record of his renditions to be heard on the Ampico immediately after he personally had performed them. Indeed, as remarkable as the experiment itself is the extraordinary success achieved by the almost human instrument." 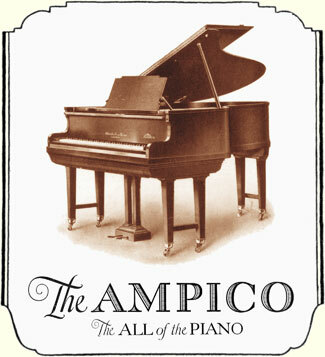 The American Piano Company had scored a notable publicity coup, and had established the Ampico as one of the two major American reproducing pianos, though perhaps for copyright reasons it always described its instruments not as reproducing, but as re-enacting the artists which recorded for it. The most famous pianist to entrust his interpretations to the Ampico was Sergei Rachmaninov, whose first rolls were issued in 1919, a couple of years after he had left his homeland for ever. In the 1980s, the Decca Record Company published long-playing records, since transferred to CD, of Rachmaninov playing by means of an Ampico concert grand piano, constructed by Norman Evans, regulated by Denis Hall of the Pianola Institute, and recorded at the Kingsway Hall in London. Both the complete CD and individual tracks are available at Amazon.com, where excerpts of all the items may be heard. Clicking the link below will open the Amazon page for Liebesfreud in a separate window, from where the complete CD may also be found. Recorded by Sergei Rachmaninov - c. 1926, New York. This roll was played back on an Estonia Ampico concert grand piano in London, in 1979. The audio recording is the copyright of the Decca Record Company, 1979. Whereas the Hupfeld Dea controlled its dynamic output by means of six fixed levels, on treble and bass independently, with fast or slow crescendos and decrescendos providing intermediate shading, the Ampico used its crescendo mechanisms to provide the overall levels, modifying these by means of six superimposed intensities, again on treble and bass independently. One might think of the Dea as a pair of fully extended six-rung stepladders on an even floor, with acrobats jumping from one rung to any other at carefully chosen speeds, whereas the Ampico provided two parallel floors that moved constantly up and down, with two six-rung stepladders whose extensions constantly varied in order to fill in the gap between the floors and the immovable ceiling. Neither system has the theoretical advantage, but in practice the Ampico was far more commercially successful than the Dea, not least because it was manufactured and sold mainly in the USA, where the available market was much greater. Such a similarity between the two types of piano suggests that Charles Stoddard based his original designs on the German system. Since the advent of digital computers, Ampico experts have for years considered that the use of three intensity pneumatics to create only six, rather than seven intensities, was something of a failure on Stoddard's part to exploit the full binary potential of his own design. However, in the light of the similarities to the Dea and the fact that Ampico published some Dea recordings under licence, the total of six intensities seems far more likely to have been a deliberate choice. 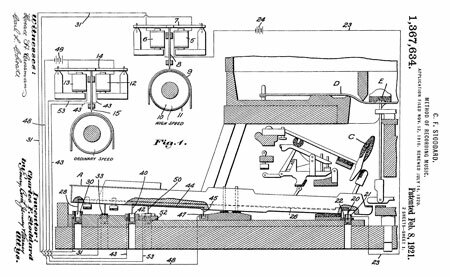 Charles Stoddard documented his recording processes more fully than any other reproducing piano inventor, so it is relatively easy to be exact with regard to his methods. At the outset, he patented two designs for recording pianos, one a somewhat impracticable upright which would have necessitated a great deal of mechanism between the piano strings and the soundboard, and the other a later modification, allowing the recording system to be installed in a grand piano, and transcribing dynamic information on to a second roll, quite separately from the note information. 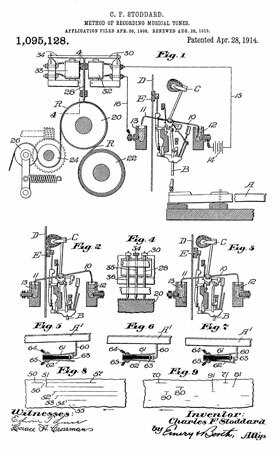 Early Ampico Recording Piano - US Patent 1,095,128 - Application 30 April 1908. In the first design, electrical contact was made by a set of two small metal rods and two mercury cups connected to each hammer shank, nos. 12 and 13 in figs. 1, 2 and 3 above. 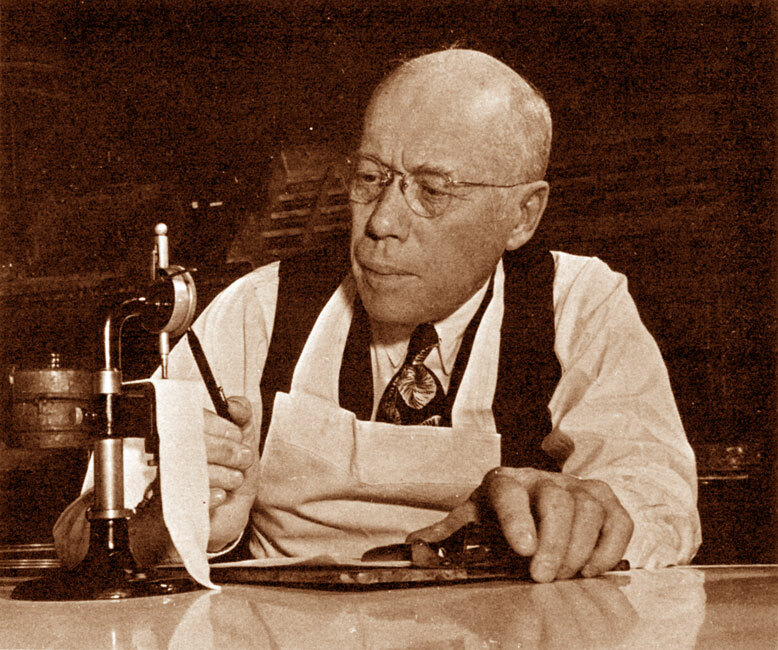 By carefully calibrating and adjusting the exact positions at which the two sets of contacts made and broke the electrical circuit, Charles Stoddard was able to record two lines on a constantly moving paper roll for each note played. At rest, and at the point where the hammer struck the piano string, one or the other contact was opened, so that no circuit was made, but during the travel of the hammer towards the string, and after the note had sounded, as long as the key remained depressed, then electricity flowed, and a line was marked on a blank roll by a stylus pressing the paper against a carbon-impregnated roller. This ingenious system resulted in a short line at the start of each note, which was inversely proportional to the force with which the pianist struck the key. The second line began the instant the hammer had struck the string and begun to rebound, and so indicated the note's duration. Ampico Grand Recording Piano - US Patent 1,367,634 - Application 12 November 1910. The second design, clearly modified in the light of practical experience, used four rods and four mercury cups for each note, one pair of contacts marking the duration of the note on a roll moving at normal speed, and the second pair completing a circuit only while the key was travelling towards its lower limit, thereby indicating the duration of travel on a roll moving at a higher speed. Although both these designs bear witness to an ingenious intellect, the dynamic recording process seems not to have been successful in practice, because in interviews in the 1970s, former members of Ampico's musical staff talked of the Company's early recording producers marking the sheet music with wavy lines, according to the pianist's dynamics, and made no mention of Charles Stoddard's automatic mechanisms. Marguerite Volavy Recording for the Ampico - New York, Autumn 1917. One advantage of the neat electrical construction was that the contacts needed space only above the keybed of the piano, so that there was no wooden compartment to get in the way of the pianist's knees, as happened with the Welte-Mignon and the Philipps Duca. 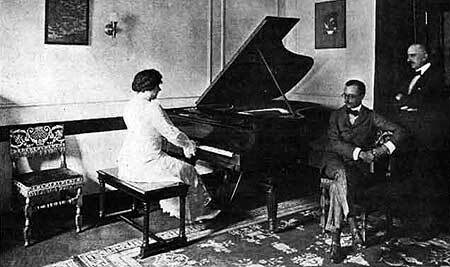 Over the years there was more than one Ampico recording piano, and the photograph above shows Marguerite Volavy recording the Grieg Piano Concerto in 1917, while the counterpart below shows a Mason and Hamlin grand which was in use around 1927. 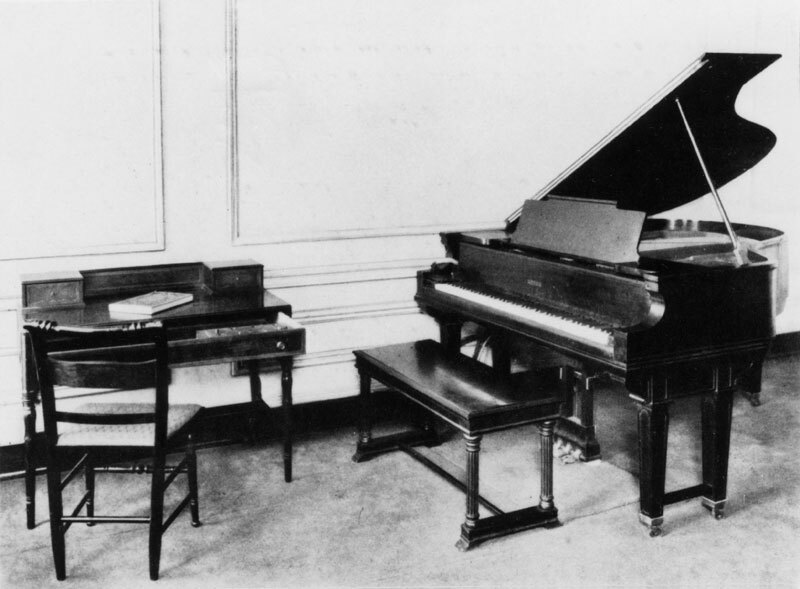 In the drawer of the adjoining table was a control box, with a press-button switch to signal to the recording machine operator in the next room that the pianist was ready to play, as well as a indicator lamp which confirmed that the recorder was in operation, and that the pianist could proceed. Ampico Recording Piano at Chickering Hall - 29 West 57th Street, New York, 1927. 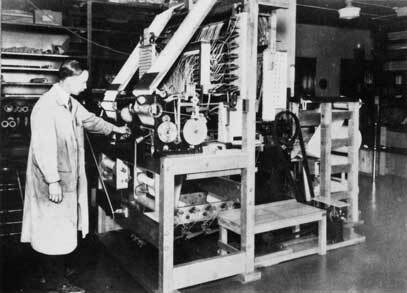 In 1925 and 1926, a new Ampico recording machine was developed by Clarence N. Hickman, a young engineer taken on by the Company in 1924, who had a Ph.D. in engineering, unlike Charles Stoddard, who was largely self-taught. 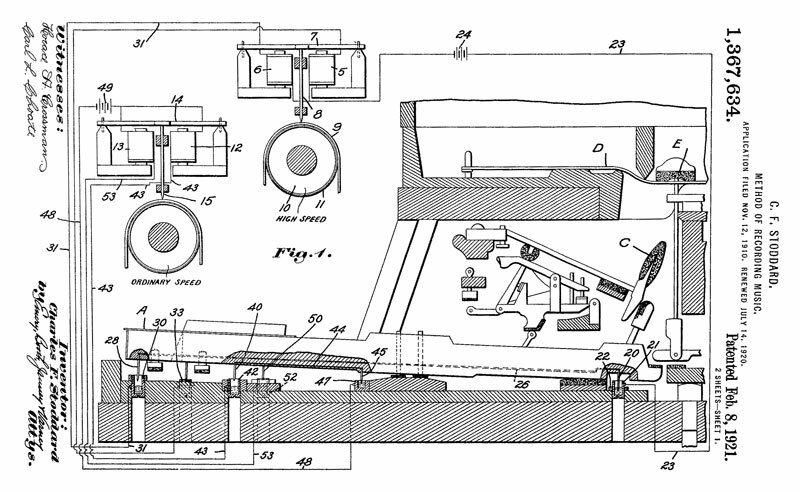 Stoddard's influence can nevertheless be seen in the new machine, which maintained the principle of recording a pianist's performance on two rolls, one for the notes and the other for the dynamic information. However, instead of measuring the speed of key travel and marking it by inking a normal paper roll, this new apparatus used the discharge of electrical sparks through chemically prepared paper, and was able to measure the duration of the final eighth of an inch of hammer travel, to an accuracy measured in hundred-thousandths of a second. The Ampico spark chronograph was widely documented in musical and scientific literature of the time, notably in a copiously illustrated article in the Scientific American of November 1927. Ampico Recording Machine with Spark Chronograph at the left - New York, 1927. It is one thing to be able to measure the force with which a particular note is played, but quite another to convert this information into the two sets of perforated dynamic codes, one for treble and one for bass, which is all that a reproducing piano can respond to. 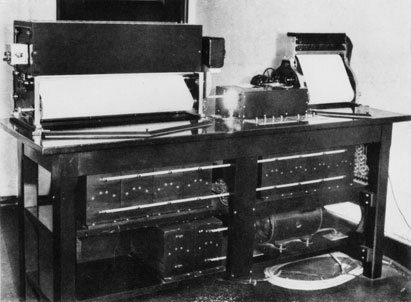 If one is to believe the Scientific American article, then a not inconsiderable army of musical technicians was employed by Ampico, measuring and transcribing the information on the spark chronograph rolls, and converting it by means of tables and charts into pre-ordained crescendo, decrescendo and intensity coding. Charles Stoddard was rather proud of the fact that the Schulz-Evler arrangement of Johann Strauss's Blue Danube, as recorded by Joseph Lhévinne, took over five weeks to produce, and needed over 100,000 separate operations. According to Mr Stoddard, there were 7,915 notes, each of which required thirteen or more operations to prepare, although the British computer expert, Anthony Robinson, states that 8,106 is a more exact figure! Ampico Master Perforator - New York, 1927. But Mr Stoddard was a wily bird, not above placing a redundant red light on his master perforating machine to impress visiting journalists, and it might perhaps be wise to take his statistics with a pinch of salt, or at least not to extrapolate them to the whole Ampico catalogue. The spark chronograph came relatively late in the history of the Ampico, and most Ampico rolls were prepared in the older way, with musical editors marking up scores and using their instinct and judgment to create effective dynamics. These members of the musical staff should not be passed over without a mention; Theodore Henrion, a Belgian who had studied with Godowsky in Vienna, was the first chief recording producer, until he succumbed to the New York 'flu epidemic around 1918. His relationship with Godowsky may well explain why the older man played an important part in the public launch of the Ampico in 1916. 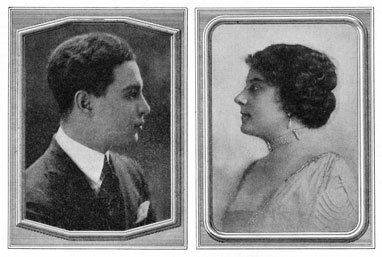 Henrion was succeeded by Milton Suskind, a young Polish-German American who joined Ampico in 1916 at the age of 18, and duly changed his name to Edgar Fairchild, the surname being a rough translation of the original German. Fairchild became Rachmaninov's "personal" roll producer, and was also responsible for the editing of rolls by Lhévinne, Artur Rubinstein, Moiseiwitsch and Levitzki, amongst many others. Rumour has it that he lost his job as a result of arriving late for an important meeting with Rachmaninov, but it seems unlikely that such drastic action would have been taken simply as a result of one lapse of business etiquette. Whatever the case, he left Ampico at around the time the spark chronograph was introduced. Edgar Fairchild and Marguerite Volavy - New York, 1925. Other roll editors included the Czech concert pianist, Marguerite Volavy, who left her muscular mark on many rolls, and was generally known as "Madam" to her colleagues, not so much out of politeness, but because she was said to resemble the "madam" of a brothel. 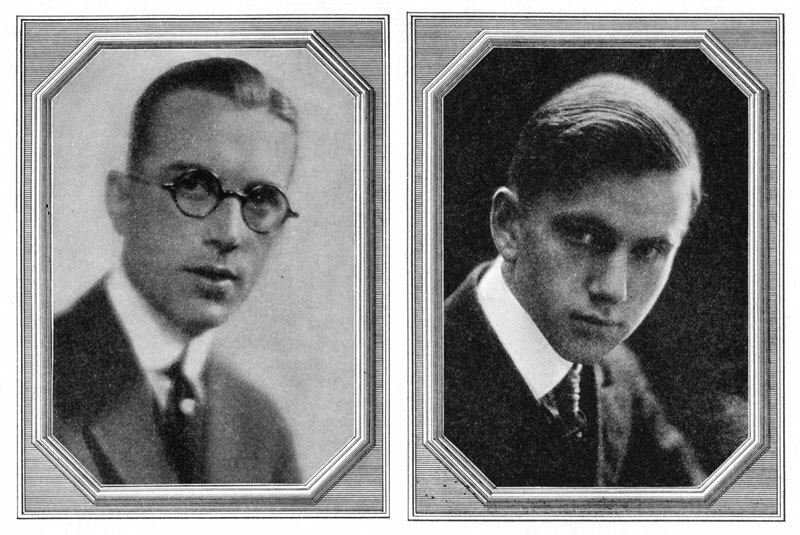 Adam Carroll and J. Milton Delcamp had both worked as musicians and arrangers at the Autopiano Company, and both made the move to Ampico at the outset of the 1920s. J. Milton Delcamp and Adam Carroll - New York, 1925. It is easy enough to report such basic facts on a webpage like this, but there was clearly an indefinable "buzz", a sense of excitement at the Ampico recording studios in the 1920s, which is less easy to express in words. One way of touching this atmosphere is to watch a surviving video of Edgar Fairchild playing two-piano music with Robert Lindholm; the latter had no connection with Ampico, but Fairchild's almost childlike delight in his own virtuosity leaps out across the decades. Click on the picture below to open the film, kindly provided through YouTube by British Pathé. 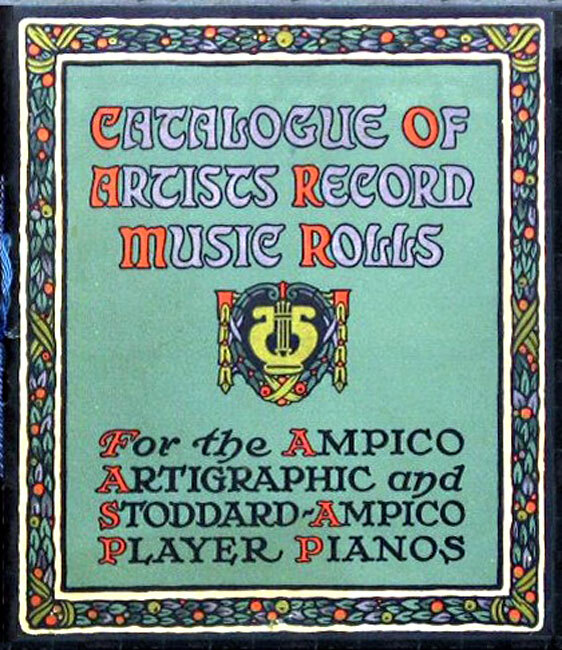 Although the Stoddard Ampico was in existence for at least a couple of years before Aeolian's Duo-Art was launched in March 1914, it was not at that time a major reproducing piano with a large roster of international pianists, and Aeolian had lost no time in signing up as many well-known artists as it could find, mostly on exclusive contracts. 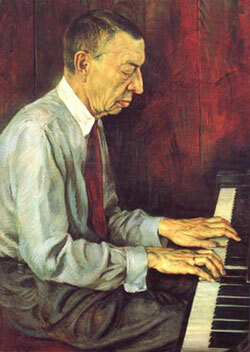 This left Ampico with less of a representative selection of pianists to call upon, though it was lucky to acquire the services of Rachmaninov, who moved to the US about a year after the Ampico's main public launch in 1916. Perhaps the Russian composer preferred to be the top dog with Ampico, rather than living in the shadow of Paderewski at Aeolian. 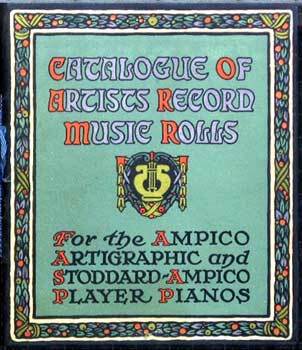 An Ampico Music Roll Catalogue - New York, 1925. Leopold Godowsky also migrated to Ampico, as did Josef Lhévinne, Moriz Rosenthal and Ernst von Dohnanyi. Rachmaninov's friend, the violinist Fritz Kreisler, was a first-rate pianist, and made several Ampico rolls of his own compositions, and, rather bizarrely, Richard Strauss recorded the accompaniment to a number of his own songs - certainly candidates for being recorded on to CD nowadays. 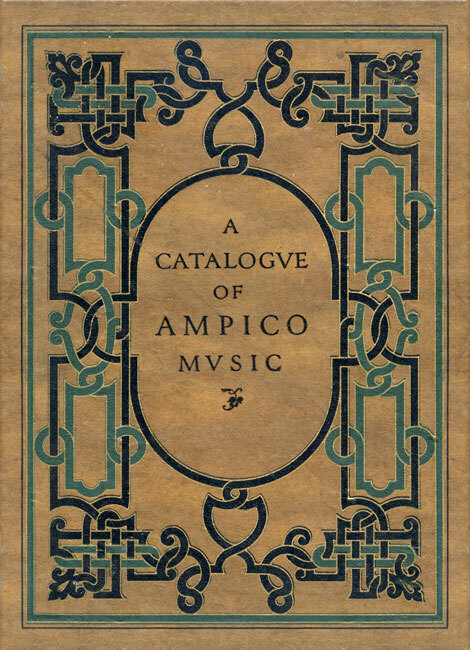 From a classical perspective, the Ampico catalogue was populated mainly by recordings from a younger generation of pianists, such as Alexander Brailowsky, Mischa Levitzki, Benno Moiseiwitsch, Erwin Nyiregyhazi, Leo Ornstein, Olga Samaroff and Robert Schmitz. Ampico also had an arrangement with the firm of Ludwig Hupfeld in Leipzig, by which it published a number of Hupfeld Dea recordings under licence, and by this means it acquired another dozen or so artists, including Grieg and Saint-Saëns. The Dea dynamic coding was not unlike the early Ampico system, so it made sense to co-operate in this way. Zez Confrey, Ferdie Grofé and Vincent Lopez - New York, 1925. But where the Ampico really shone was in its repertoire of popular music. 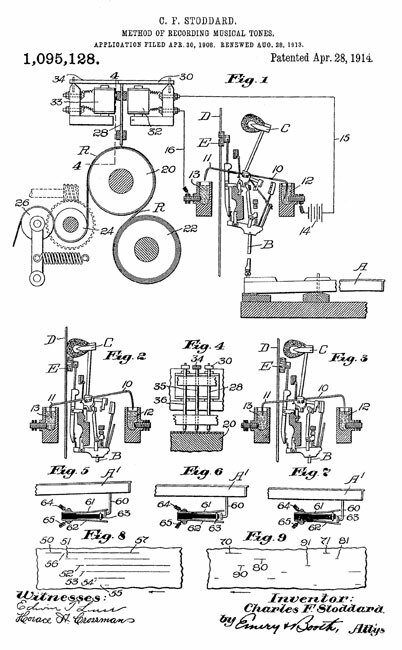 The mechanism of the Ampico, with its double valve units and carefully thought out pneumatic capacities, was snappier than the Duo-Art, and by design or good fortune, a lively band of musical arrangers and "hot" pianists gravitated around the Ampico Studios, and not only recorded their versions of the latest hits, but in many cases created musical arrangements that almost no-one could have played by hand. Zez Confrey and Ferdie Grofé, who was Paul Whiteman's pianist, were regular Ampico recording artists, and the ingenuity of the Company's publicity department can be seen by the fact that the only musician shown in the 1925 Ampico roll catalogue actually sitting with his hands on the keyboard of the recording piano was Vincent Lopez, a dance band leader whose rolls were generally arranged by hand and not directly recorded.